Crowds of people were cheering as I entered the Hoxton Square Bar and Kitchen; support act Corella were in full swing. Having already supported the likes of Marsicans and Cassia, I was excited to see what the Manchester four-piece would be bringing to this intimate venue before headliner Larkins. From the start, Corella launches you into a dance euphoria you can’t escape from. You move to the jangly summer vibes in the melodies guitarists Jack and Joel produce during Barcelona Girl, as drummer James and bassist Ben pick up the pace with their tight drum patterns and groovy bass lines. It’s lead singer Joel that gets the crowd involved, whether that be dancing, clapping or singing along, with his charismatic aura on stage. Playing an array of their songs such as Fever and their latest single Let On, the recorded versions are incomparable to the impactful live versions; the hooks of the guitar riffs ever more prominent, the vocals spreading across the room, and the rhythms running through you. It’s safe to say, Corella were a fantastic way to warm up the over excited crowd before Larkins. 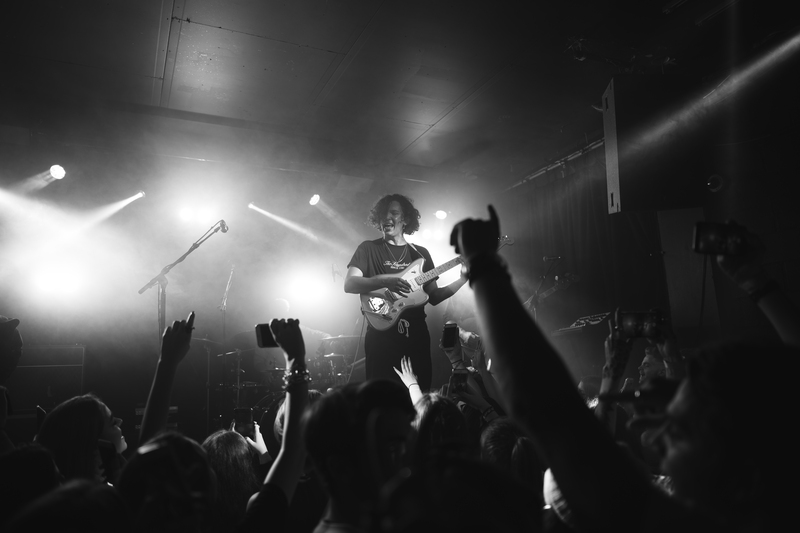 I was surprised by the ages of some audience members – under the impression the crowd would be made up of the typical indie band gig-goers, the sea of younger girls at the front was a refreshing sight. With the end to Made of Stone by The Stone Roses lingering in our ears, darkness surrounded us signalling Larkins’ arrival to the stage. 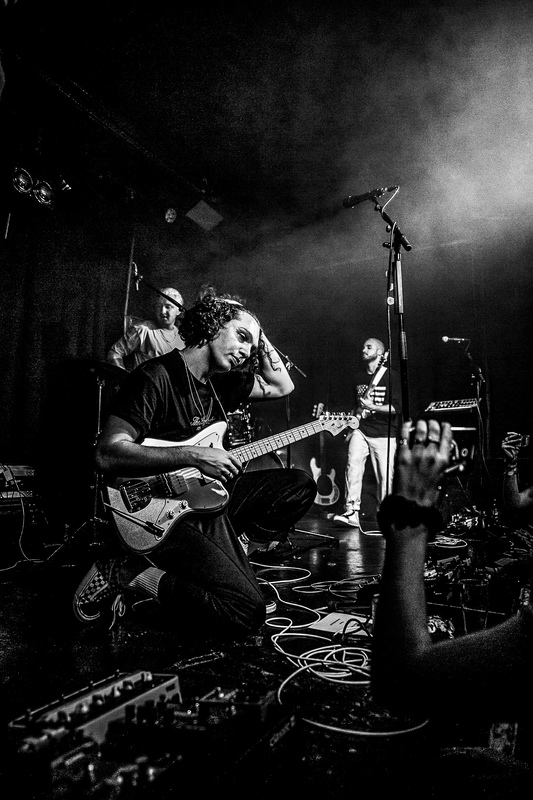 Launching into The 1975-esque opener: Are We Having Any Fun Yet?, Larkins left the crowd mesmerised and from then on it was nothing but high energy from the band and their fans. I remember the last time I saw Larkins perform; opening for Dr John Cooper Clarke at Kentish Town’s O2 Forum just over 2 years ago. Looking back, Larkins were nothing compared to the performance and finesse they were displaying now in the tiny, sweaty London venue. As well as their undeniable talent throughout the set, it was clear from the start Larkins are a genuine, humble band. They continuously thanked the fans for buying tickets and selling the show out: at one point lead singer Josh explained how “Manchester bands shouldn’t travel down South as it tends to not go well”, but based on the reactions from the crowd and their energy-filled set, it went down a right treat. Along with an extreme love for their fans, Larkins showed a true passion for what they do. The smiles that spread across their face whilst they played were infectious for me as a viewer, I couldn’t help but grin and dance along as the infamous synths and intricate melodies of TV Dream soared from the speakers. Propelled into a nostalgia of sunshine and summer, myself and the rest of the audience were entranced in a blissful bubble the band were creating through their sounds. Ending on fan favourite Something Beautiful, I was lucky enough to see the natural way this four-piece merged together to be what we know as Larkins. Whether it was guitarist Dom’s movements as he played the sweet guitar jangles, Henry’s anthemic groove in his bass lines, Joe’s fast-paced drums, or Josh’s mellow yet punchy vocals; when they come together as one, it is truly a live performance you are going to want to see.